Industrial lighting leader, Larson Electronics LLC, has just announced the newest addition to their flood light selection, an explosion proof emergency flood light with Cree LED technology and a remote battery backup, providing a powerful and energy efficient luminary for hazardous locations. This unit is an excellent replacement upgrade for bulky and high maintenance, costly fixtures. The emergency back-up features installed in this LED flood light provide operators with an incredibly reliable fixture. An emergency battery combined with multiple independent LED drivers keeps this unit functioning in unexpected outage situations. The EPL-EMG-LED-100W-RT Class 1 Division 1 and 2, Class 2 Division 1 and 2 explosion proof emergency LED flood light provides 11,667 lumens of high quality light and draws only 100 watts. The addition of a remote mounted battery backup unit turns this flood light into a reliable and useful emergency fixture. This LED flood light will run at the standard UL suggested 90 minutes after power is lost at 2,625 lumens. Once electrical power is restored the light recharges the battery and keeps it in a steady state. On top of the emergency battery features, this flood light unit contains eight individual LED boards configured into a series of banks – each bank containing two LED boards and a driver. This internal set up ensures that in the event of driver failure, only one driver will be affected, while the other 3 continue to operate as normal. This greatly increases the operational life of the fixture. 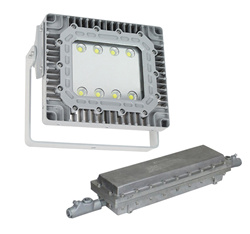 To further increase the life of this explosion proof flood light, a special heat dissipating design and LED technology helps this fixture achieve a 60,000 hour rated lifespan with 80% lumen retention. This emergency lamp is IP67 rated, dust-proof, and protected against high pressure jets and temporary submersion, and built with copper-free aluminum alloy body coated for durability and resistance to vibration and impact.